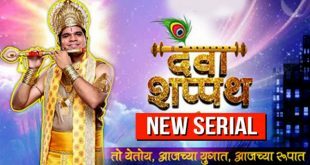 Zee Marathi is all set to launch it’s new serial Nakti chya Lagnala Yaycha Ha. It will go on air from January 18. The show is a family drama with an ensemble cast with the traditional Marathi flavors. The promos of the show look very interesting and have a fun feel to it with the members of a joint family pepping up for a wedding ceremony. The story revolves around the character of Nupur played by the beautiful Prajakta Mali who is an accomplished actress in Marathi serials, dramas and films. Prajakta who had previously made a mark for herself as a dancer, had done few serials. On the small screen, she has tasted success with the show Julun Yeti Reshimgathi. She had impressed Marathi audience with her role of Meghana. Now she is returning on the small screen after a break. The promos show her as a bubbly adorable family girl for whose marriage the whole family is making preparation. But yes, we have no clue about the groom. Prajakta plays Nupur in the show. In the promo , she looks gorgeous adorning a yellow red traditional saree. Others actors in the cast include Poornima Talwalkar and Varsha Dandale. The full – house theme of the show coupled with the backdrop of a marriage seems to be very interesting recipe for a total entertainer. Nakti chya Lagnala Yaychya Ha will be aired on Zee Marathi in the Wednesday to Saturday Time Slot at 10.00 PM.